In Writer the Navigator, the gallery and the Styles&Formatting window are integrated in the Sidebar. However, when you activate one of them via the menu/toolbar/shortcut, they still open in its own window (see attached screenshot). That brings some confusion. I suggest that they would always be opened in the Sidebar. Could be that people like to have behaviour diferent from the side bar for F5 and F11 ? Suggest to have a good discussion on this on the UX-list, related to other discussions / ideas on the side bar, styles and formatting and such ? Can you have a look at this issue please? Different actions to show sidebars floating or docked? Sounds like bad usability, if I got you right, because it mixes enabling and kind of visualization. I suggest to always show the header for sidebars to indicates its features. This could be an improvement to the Navigator but must not be shown with the standard toolbar. The default state of 'major relevant' toolbars should be docked, which might be Samuel's intention. Some other 'minor relevant' toolbars are shown rather floating by default, e.g. Extras. I guess the actual behavior, some toolbars are docked right now others are not, is done by hard coding. Finally, keep in mind that sidebars are very handy for widescreens but with a 4:3 15" display I'd like to see all text. So my conclusion is to keep it as it is but store last user setting (cf. ticket #55087). This is one of the problems that the sidebar brings -- now there are two Navigators, two Galleries, and two Style panels. The benefit of individual panels is that two can be open at a time, while the Sidebar includes features not found in individual panels. Ideally, the panels unique to the sidebar would be turned into separate panels, and panels in general would be allowed to be stacked into tabbed groups, much like panels in GIMP (or Adobe's tools). @mirek: listening to our discussion today, I would suggest to close this one as 'Wont'Fix' ' ? Wait wait wait ... I'd rather keep the sidebar version of these than have a mess of panels. You won't be able to process too many panes at once anyway, so why bother? The sidebars docking mechanism is soo much nicer. > so why bother? The sidebars docking mechanism is soo much nicer. I'm sorry if my comments have postponed a solution -- the current situation is really unacceptable. Unfortunately, it seems that no ideal solution will be worked out soon, so I propose making all relevant buttons (including toolbar buttons and menu items) open the sidebar pane rather than the panel equivalent. If it's easily implementable, we could have an advanced option for showing panels instead of sidebar panes. If there's a problem because some people need two panes at once, we'll get that feedback and we'll work to split up the panes in question (or work out a better solution). That means we need to enable the sidebar by default. The question then is, if we should not rather remove the affected buttons from the default toolbar since we have them in the sidebar? > That means we need to enable the sidebar by default. > from the default toolbar since we have them in the sidebar? I guess the best thing to do now, though, is remove the toolbar buttons and show the sidebar by default. However, the "More..." entry in the style picker, certain keyboard shortcuts (e.g. F4), and some menu bar items still need to be remapped. It might make sense to have a "Sidebar" submenu under "View", listing the individual sidebar panes. I'm not sure a submenu for sidebar panels is a good idea. Not every panel has a menu entry. Also how would you hide the sidebar then? I implemented the Impress part for the navigator and gallery. Every action that opened a floating window before shows now the corresponding sidebar panel. If the sidebar is hidden, it will become visible. It seems that it is a common case that the navigator and the Styles&Formatting window is open at the same time (see bug 81902 e.g.). Word also has the navigator on the left side by default. So I think we should still allow the navigator to be in a floating window (until the multiple sidebars are supported at least). I suggest to remove the navigator icon from the toolbar and have it only in the menu (which would open the floating window) and in the sidebar. I feel really uncomfortable with this approach! You already have feedback from people that work with more panes. Professional writers make most of their writings on big documents. They also use advanced tools that were created just for helping manage big documents: the Navigator and the Stylist. Hence, both *must* be present at once on the screen, in anchored state, of course. The current SideBar has some niceties and could be a nice support for the two panes we're discussing here. But it lacks the capability of displaying both the Navigator and the Stylist at once. Not having this feature while dismissing the "traditional" Navigator and Stylist panes will make professionals uncomfortable. This would cause plenty of useless mouse clicks (hint: keyboard shortcuts would be a nice enhancement btw) which would break the user's workflow. > screen, in anchored state, of course. As I said, the ideal solution would be to have detachable panes in the toolbar -- the same approach that GIMP, Inkscape, and Adobe CS programs take. It'd be great if you could find someone to work on that. The compromise that I would suggest, then, if we must have the individual panes as well as the sidebar, is to put the panes into "View > Floating Panes" (and remove them from the toolbar). For me this bug report should be seen as a duplicate of bug 33223. > Panes" (and remove them from the toolbar). Would it be ok to keep *only* the navigator in a floating window and remove the floating windows for Gallery and "Styles and formatting"? That way users can have "Styles and Formatting" and the Navigator open at the same time, but we still can start taking the sidebar seriously. Sure in the long run we should enhance the sidebar to allow docking etc. But that is really a lot of work (compared to this task). > For me this bug report should be seen as a duplicate of bug 33223. Well if you do the development for bug 33223 then you can close this one. If not then I'll implement this as discussed here because it's way less work. Isn't this bug much more specific? > the floating windows for Gallery and "Styles and formatting"? > the same time, but we still can start taking the sidebar seriously. Interesting thought. Also there is an bug report to bring Styles prominent in the side-bar. So opening the Styles&Formatting in the side bar ánd changing the Font/Paragraph props pane so that it enhances the use of styles can conflict maybe? > > Panes" (and remove them from the toolbar). I think that it sounds like a great idea, it is probably the best that we can do at this point at least. Personally I prefer my navigation panel to the left so I'm probably a bit biased. ;) But I'd also like to add that navigation panels is normally located to the left, at least in the programs I use. > > For me this bug report should be seen as a duplicate of bug 33223. > Isn't this bug much more specific? Yes, the current bug decide for the user what is the best for him. I prefer a solution more versatile which give the user the ability to adapt the UI to its needs and taste. I agree that my proposition requires probably more work to be implemented, but once that is done, you can do what you want with sidebar and the toolbars. Currently the sidebar in Writer is shown by default (expanded) since I have not yet found a way to show only the icons by default. Great! Hope to give it a test drive tomorrow. Might I suggest though that with this refactoring, and with Thomas A.s work on assigning an actual default SideBar Tab today, http://cgit.freedesktop.org/libreoffice/core/commit/?id=d3ebe3e3dcdb89b7713641241f7d431352ba8c5f now would be the perfet time to also change the ordering of the Tab bar and make the "Styles & Formatting" tab the first listed and the default SideBar "Content Panel". This would help de-emphasize the direct formatting fostered by the "Properties" tab and panel when it becomes the second tab listed and is no longer the default. For further discussion of the default Deck, see Bug 65351. AFAICS the legacy 'gallery' thing is reasonable to remove in favour of the side-bar. Wrt. the icon strip down the side of the side-bar, that is just a waste of space AFAICS - having that either in a nearby toolbar [hard], or in a horizontal 'tab bar' style toolbar at the top of the side-bar would make much more sense (to me). There are a number of functions already available in that code (interestingly) and not enabled that may be worth playing with. > much more sense (to me). Only problem there, is that while the Tab Bar UI could be rotated horizontally, and its width dynamic (taken from width sizing of the TitleBar and Deck) it would need horizontal slider to expose the Tab icons for all decks--would get kind of ugly. Oriented vertically, it is fixed but not too obtrusive. > (interestingly) and not enabled that may be worth playing with. Yup, when Andre Fisher did the port for AOO of the Symphony contribution he didn't get too far removed from the original functions--but provided a lot of framework for later enhancement. Currently the whole Side Bar can be un-docked but that UI frame can not be duplicated--the decks are only linked to the one frame. It would be much more functional if all of the decks could be un-docked, each into their own frame. Support for multiheaded systems would be much improved. And power users would be happy to have option of continuing to work as in the past with Navigator, and Gallery floating. > > much more sense (to me). > decks--would get kind of ugly. Using a right-aligned toolbar instead would solve this problem. A problem with having the buttons in a (right-aligned) toolbar is that the toolbar always stays in the same place, but you can move the sidebar to the left e.g. I think the current situation (vertical tabs) is the best compromise. 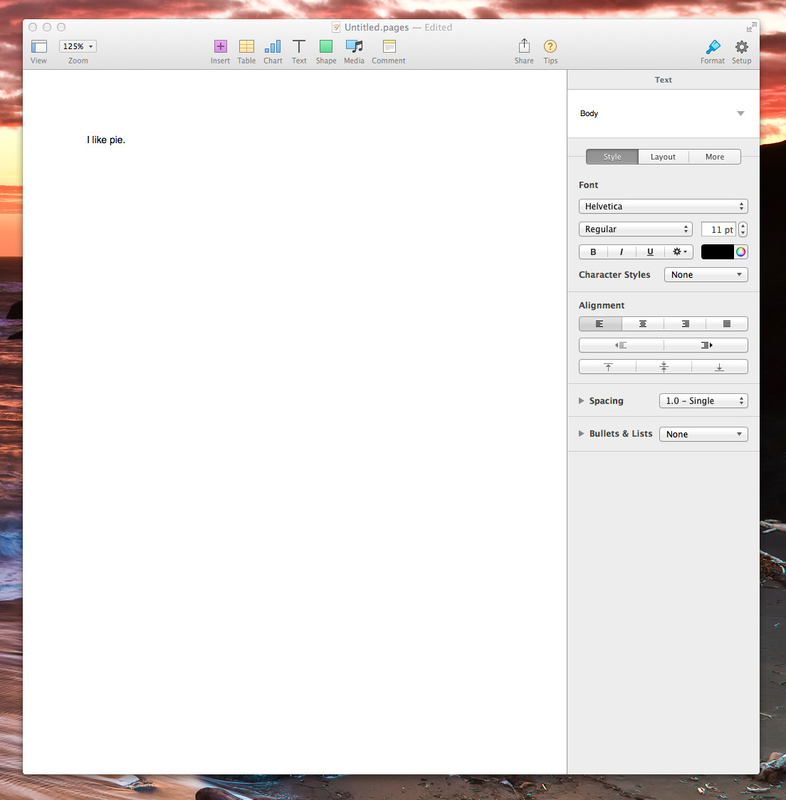 Tested it in writer and it looks good, except that navigator isnt activating the sidebar yet. Thanks for removing those least used buttons which i had already recommended in my toolbar proposal (bug 81475), as it gives way for the addition of useful buttons like inserting an image (bug 82822), footnote (bug 83117) and comment (bug 83118). Daniel had suggested a mockup of the tab button appearing in the toolbar area - http://i.imgur.com/uvEVi5w.png - though i think it should actually be part of the sidebar and elements being able to pull out of the sidebar, like in photoshop and gimp. > it looks good, except that navigator isnt activating the sidebar yet. @Jay: That's intentional, see comment 16. > Daniel had suggested a mockup of the tab button appearing in the toolbar area - http://i.imgur.com/uvEVi5w.png - though i think it should actually be part of the sidebar and elements being able to pull out of the sidebar, like in photoshop and gimp. Being able to pull out elements from the sidebar is a long-term goal. It will take some time to implement and is definitely too big for me. So we try to make the best out of the current situation. The tabs need to stay with the sidebar since you can move the sidebar to the left and the tabs need to move also. So why not have the navigator dock by default in the left side, as i've seen screenshots from a number of users where they docked it this way. Also there was a discussion recently in bug 83026 and most agree that navigation elements are fine to be docked on the left. Users will still be able to undock it if they want to have it floating. Hi, I have a question regarding the move of styles and formatting into the sidebar: My workflow working on long documents is to have the navigator docked to the left side and the styles&formatting (& formatting) docked to the right side. Hence, for long documents it is not user friendly to be forced to have both in one sidebar. I assume that this workflow is common for everyone who works on long documents. Will it be still possible after these patches in this bug report to have these functions separated, i.e. one on the left, the other on the right side? Or do these patches block this workflow? If so, please consider this user scenario as a relevant one. > user scenario as a relevant one. 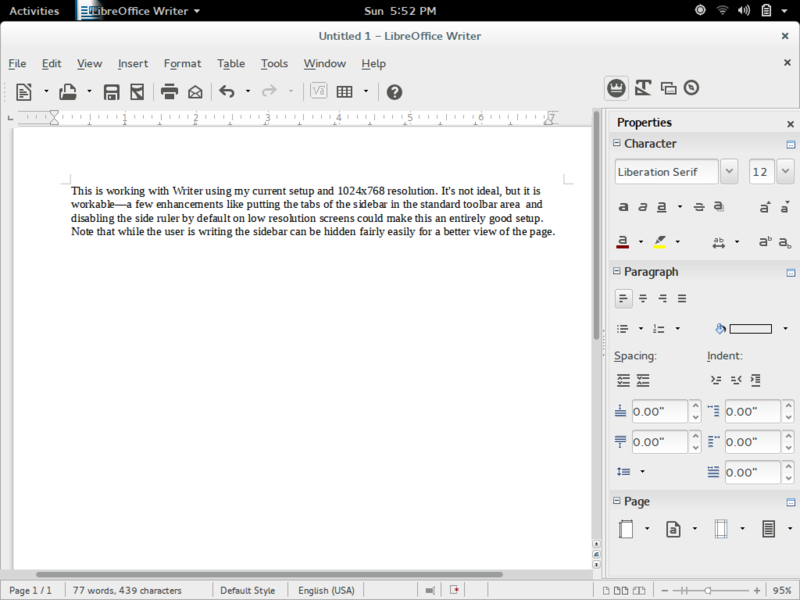 Yes, multiple users use Writer this way and we have decided to leave the Navigator in its own Window. So you can place it where you want as before. Revert "fdo#73151 Always open Styles&Formatting dialog in the sidebar"
Closing this - if there are still issues with this please open a new bug. Now enabled by default in Writer, in addition to Impress (where it was enabled since 4.2). Also, the Sidebar now combines the functionalities of the old “Gallery” and “Styles & Formatting” floating panels, removing a lot of UI redundancy. This change is the total antithesis (opposite) of what I and some of my clients want. I would have proposed a user selectable/definable option, instead of this "all or nothing" approach. Should I reopen this, or submit a new RFE bug? > instead of this "all or nothing" approach. > Should I reopen this, or submit a new RFE bug? Please do not reopen, never helpful. Rather submit a new concise description of what is perceived as useful. And more importantly describe how UI would function relative to the current defaults of Gallery and Styles & Formatting resident as Sidebar decks? Otherwise looking forward to your new RFE and reviewing its description. Thanks Stuart. I had missed this in my Bugzilla search and have now added my thoughts/comments there.